Our street was dedicated to her today. 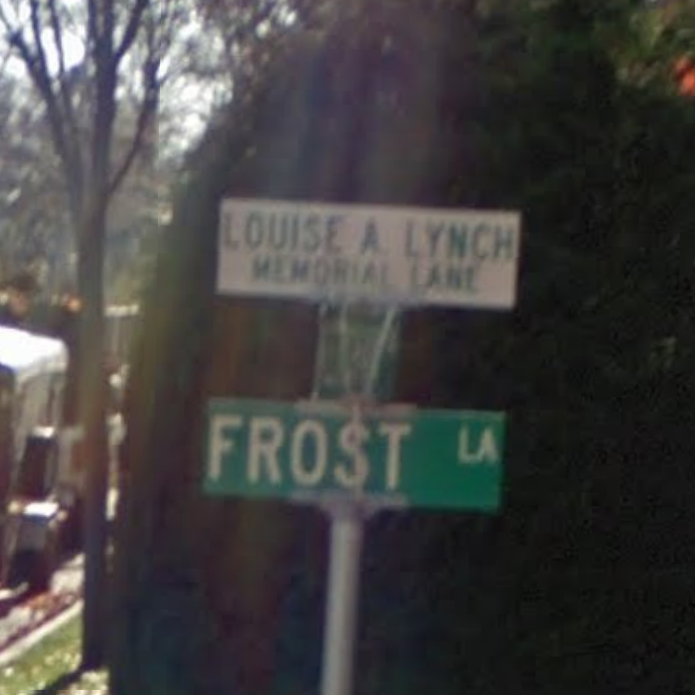 Louise A. Lynch Memorial Lane. e-mail me! Maria, I’ll send you an e-mail later today. Thank you for your kindness. And thank you for sharing your Mother’s enduring legacy with the world. I feel bad that I wasn’t able to truly honor your Mother, in the manner which she richly deserves. Hopefully I can do better next time. Every year the struggle for me is to remember to honor those precious souls lost that terrible day, and to try to suppress this terrible rage I have against those vile perpetrators. They can have the other days of the year – I want to reserve this day for the grace of good people such as your mother. I really appreciate your comments, and I look forward to dropping you a note soon. My thoughts are with you and your family this day. Maria, I was about to e-mail you this when I saw you had found it earlier this morning. You and your family are in our thoughts and prayers today, along with all of those who lost a loved one 8 years ago today. Thank you for reposting and updating this. How wonderful that Maria’s efforts to ensure Louise’s memory lives on produced such enduring results! Great post. I am from Amityville, NY. I used to see Louise with her daughter at 12 o’clock Sunday Mass at St. Martin of Tours, Amityville. I would see her at the Amityville train station. I remember she took the 7:04 am train to Brooklyn. (At the time I was a Long Island Rail Road empoloyee). One night I found a cell phone on the evening train. I picked it up and called it. It was Louise’s phone, but I did not realize who she was until I delivered her phone to her home. When I saw her picture on TV at one on the 9/11 rememberance ceremonies, I was shocked. I don’t think a day goes by that I don’t think of her. Mary, thanks for keeping the memory of Louise close in your heart. More than any other soul lost on that day, Louise is the one that touches me daily. Thank you for compiling Louise’s facts of life and posting this article. This past weekend, on the 10th Anniversary of the attacks, three thousand flags were on display in a small town in southern PA. It is known around here as the Healing Field. Each flag had a card with someone’s name who passed that day along with a small bio. The sea of flags was absolutely breathtaking in the most intense way. I chose to sponsor a flag for my family and, after reading many cards, I chose to sponsor Louise. What struck me on her card was the dedication she had to her daughter and it mentioned they were best friends. My little girl is three and I would be lost without her. Thankfully, through this site, I was able to learn much more about Louise and put a face to the name. Her flag is in my house with a yellow ribbon tied under the flag and a black ribbon on the top. I will never forget the events that transpired on 9/11, my children will grow up to know the truth, and Louise will be fondly remembered in our home. God Bless her family and the USA. Thrilled to hear that you selected Louise’s card from the many souls lost that day. What a legacy Louise has left us. Today my Catholic high school did a prayer service during all theology classes for all those who lost their lives in 9-11, 10 years ago. During the prayer service, they handed around a basket with bracelets. On the bracelets were written names with ages on them; all of whom had died on 9-11. Our school did this in cooperation with other Catholic schools, but I’m so glad I was able to research Louise and find out something about the person whom I was praying for today.